Speedy Pros, Inc - The experts at Speedy Pros can help you with all your visual communication needs, including custom signs, banners, graphics, t-shirt printing, embroidery, promotional products. The experts at Speedy Pros can help you with all your visual communication needs, including custom signs, banners, graphics, t-shirt printing, embroidery, promotional products. 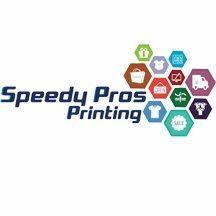 Speedy Pros Printing and Embroidery is located in Brandon, FL. Founded in 2003, we are a family owned, local custom printing business that's been serving the Tampa Bay area for 15 years. We pride ourselves on our customer service and our high-quality printing for individuals and businesses. The experts at Speedy Pros can help you with all your visual communication needs, including custom signs, banners, graphics, t-shirt printing, embroidery, promotional products. Let CRD Wraps help you take your business to the next level through high quality, custom designed vehicle wraps. Our promotional products are used by thousands of organizations as: Door Openers, Tradeshow Traffic Builders, Special Events, Corporate Gifts, Fund Raising, and Premium Incentives. The Guthman Way: We Make Signs, Simple. The best promotional products company with the service to match.